Written by Shaina of Food for My Family. To clarify, there are plenty of the same things over and over: lettuces, chives, spring onions, peas, asparagus out the wazoo and radishes as far as the eye can see. Three years ago, I was not so interested in radishes. I would eat them when they were available, but seek them out I did not. Then last year I had an awakening. My husband started showing up to our house with bunches of Easter egg radishes purchased from his on-site farmers market after work. He’d proclaim how pretty they were and talk about peanut butter and radish sandwiches as a child. Not being one to waste, I set about using the bunches as best I knew how, first with just a bit of butter and salt. 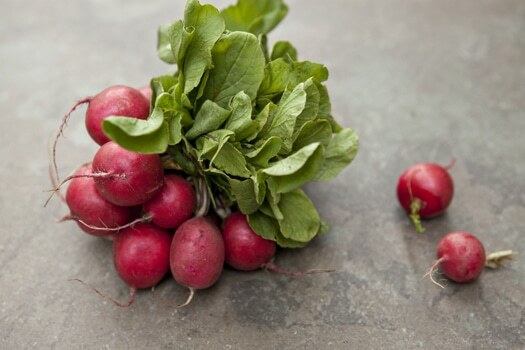 Here are three ways I’ve been enjoying radishes this year. Some inspired by Martha, like the presentation of buttered radishes as an appetizer, and others inspired by grandparents and my husband’s peanut butter and radish sandwiches as a child. These are inspired by Martha Stewart Living in their presentation, but people have been eating radishes with good butter and sea salt for much longer than Martha's been around. Scrub radishes and cut in half. Pat with cloth to dry. In a small container, mix together butter and herbs. Add to small pastry bag with your choice of tip. I used a 1M tip, but you can use anything you have. Pipe butter on top of radish halves and sprinkle with sea salt. Whether adding them to your favorite sandwich or making up your own, radishes are a zippy addition to summer sandwiches. This one boasts a creamy feta spread. Mix together feta and tzatziki. Spread on both sides of the bread. Sprinkle with sea salt. 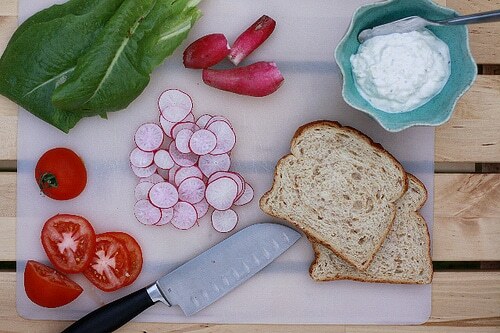 Layer on radishes, romaine, tomatoes and cover with other side of bread. At the market next to the radishes were huge bunches of sugar snap peas. They were just as prolific as the rhubarb and the asparagus spears, and they screamed to be eaten. Raw. As is or paired with those radishes and tossed in a light dressing, perfect for a summer side. 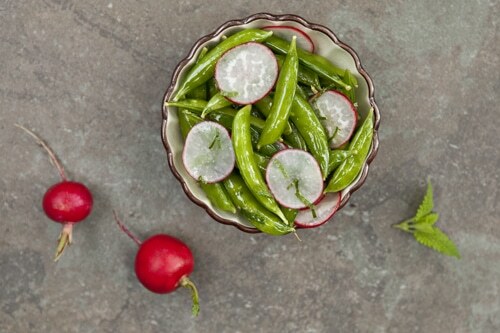 Toss together peas and sliced radishes. Add olive oil, vinegar, sea salt and toss to combine. Chiffonade lemon balm and sprinkle on top. Allow to marinate for at least 10 minutes before serving. Are there some fruits or vegetables you avoid buying simply because you’re not confident of what to do with them or weren’t raised on them? Shaina Olmanson is the home cook and photographer behind Food for My Family, where she shares recipes, tips, opinions and her philosophy on food as she wades through the process of feeding her family, her friends and anyone else who will let her. She strives to teach her four children how to eat well: seasonally, locally, organically, deliciously and balanced. I love radishes, and I thought I’d had them every which way possible, but I’ve never had peanut butter and radish sandwiches before! Yeah, the peanut butter and radish combination has never occured to me, lol. But I guess the flavors actually could compliment each other! Radishes would be my not-sure-what-to-do-with-them veggie, but these recipes sound like a great start! I’ve really enjoyed just munching on radishes by themselves in the past. Yeah, I still have yet to try that combo myself. I just shake my head every time he talks about it and move to putting mine on a vegetable-laden sandwich that appeals to me. To each their own? I have been getting radishes every week in my CSA box and am quite at a loss as to what to do with them. I don’t love the sharpness so I have been roasting / braising them. It takes out the bite and adds some sweetness. I love them steamed! Takes away all the peppery-ness and adds so much sweetness. Ooooh, I love radishes, and these are all fabulous ideas! I especially love the sandwiches — how perfect for a light lunch! Thanks for sharing. My grandmother always had them in her refrigerator, and we would douse them with salt as a treat. I’ve never gotten past eating them that way for it takes me back to her yellow vinyl kitchen table and chairs, and the smells of grandpa’s roses out the kitchen window. I’m growing them for the first time this year. You have completely inspired me! Fun! I never have enough room for all the things I want to grow, but someday radishes will grace my garden as well. This is my first year with a CSA and I have had many veggies given to me that I have never tasted before…turnip, broccoli rabe, garlic scapes, etc. Turns out that I love them all! I have a ton of radishes and other than putting them in salads I didn’t know what to do with them. 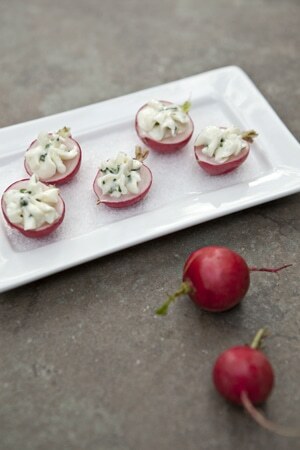 I love the first pic of radishes with butter…think I will give it a try. They are great in salads! I have also tried sauteing them like they’re onions and putting them on burgers or other hot sandwiches, which is one of my favorite ways to eat them as well. Enjoy your CSA! They definitely have the ability to make you think outside the box and try new foods at times. I loved how you clarified your teenage dating status. 😉 Great post Shaina! Love to see you on one of my favorite sites!!! Ha, well come back in two weeks and I’ll be here again. 😉 Love contributing for Aimee. I totally needed this post! I just picked up another bunch of radishes from my CSA last night and had no idea what to do with them. I’m going to try that sandwich! Did you make the tzatziki or buy it? It’s some sort of yogurt spread right? I love radishes! I usually eat them with a few sprinkles of salt but I can’t wait to try these delish ideas! I highly recommend the peanut butter and radish combo – been eating it all my life! So interesting! Thanks for sharing, Tracy. This sounds great! I recently got some Himalayan pink salt from Sustainable Sourcing https://secure.sustainablesourcing.com and I’ll have to try it out in this recipe. Thanks for sharing! Tried the radish sandwich and loved it! What a great use for radishes. Thanks, Jen! Glad you liked it.